In 2017, bat gates were installed at the entrances of two abandoned mine shafts on the southern side of the mountain in order to protect native bat habitats and prevent the spread of white-nose syndrome, a fungal disease that affects the wings and muzzle of bats. 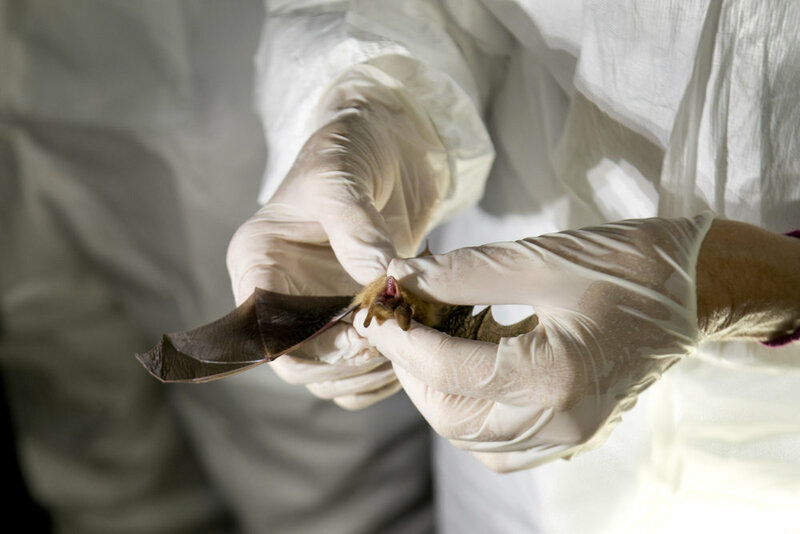 Survey and monitoring efforts to track native bat populations are ongoing. We surveyed population numbers in mines #1, #2, and #3 and swabbed for signs of white-nose syndrome, with assistance from Nick Sharp, Alabama Non-game Biologist for Alabama Wildlife and Freshwater Fisheries, and Bradley Jones, local caver. According to our Conservation Director Jamie Nobles, while the numbers were down from the 2016 survey with Dottie Brown, we still found a good number of bats using each of the surveyed mines. Preliminary numbers of mine #3 (Crusher Trail mine) were just under 500 individual tri-colored bats. We found several individuals that showed signs of white-nose syndrome, but we did not find any dead bats. Nick also swab-sampled 20 individuals for lab testing. White-nose syndrome is a fungal disease caused by the fungus Pseudogymnoascus destructans, or pd. It manifests as a white "blight" on the muzzles and wings of hibernating bats and was first documented in New York state in 2006-2007. 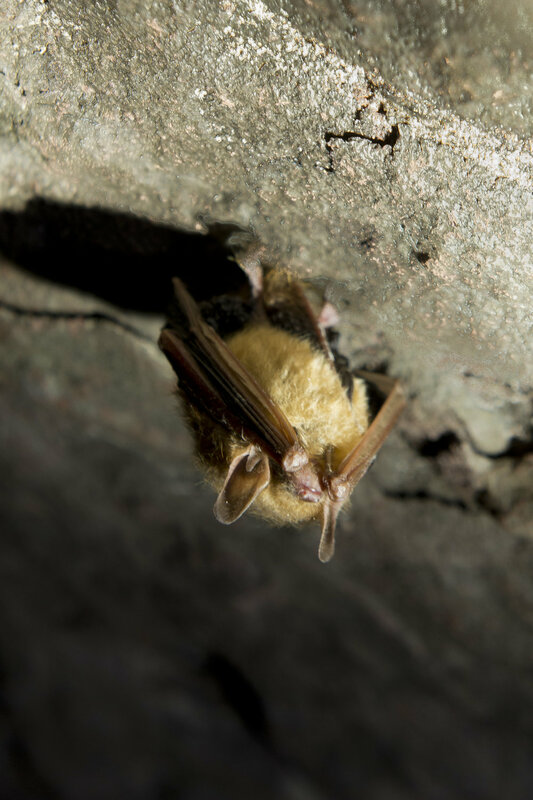 This disease is so potentially devastating because of the way it affects the hibernation patterns of native bat populations, causing them to come out of hibernation early, thereby depleting precious energy resources. Oftentimes, these bats will fly during the day or gather around the entrances to hibernacula (their hibernation grounds, usually caves)—both highly unusual behaviors. Due to this lack of energy and inability to find food, affected bats will often be found sick or dying near their hibernacula. 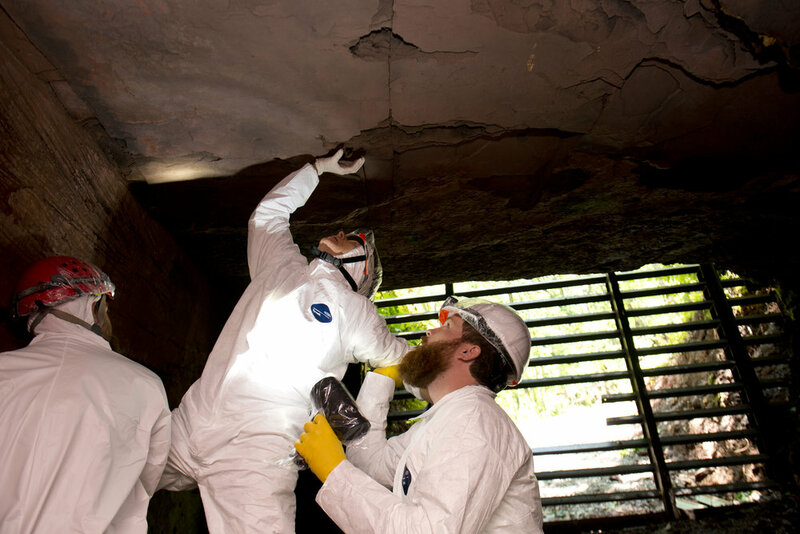 Laboratories and scientists across the country are currently investigating the transmission and fungal dynamics of white-nose syndrome and attempting to mitigate its effects. Research into its effects on Ruffner's native bat populations is ongoing. To learn more about white-nose syndrome visit https://www.whitenosesyndrome.org. See additional photos of the Mine #3 survey below.